An early start for us and a short drive up the M40 to the NEC and the first day of Crufts 2016. 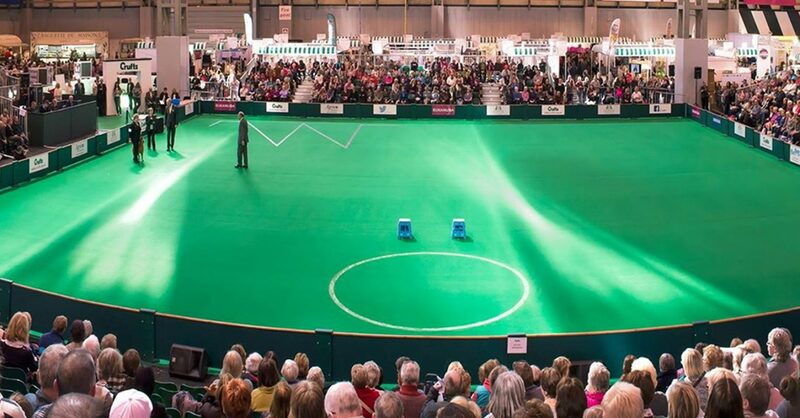 And for the Obedience community it’s the Inter Regional competition today. Arriving at Hall 5 we head for the benches to deliver a few good luck cards, grab a coffee and then head up to the seats. Today’s judge Nigel Slater and his team enter the ring at 8.40 and take up their positions on the left hand side of the ring, then the start of the parade of today’s teams, as usual for a Thursday morning there’s only a few pockets of supporters that have made their way into the stands but they greet each team with enthusiasm. Crufts was officially opened at 9am and our favourite man on the mic Gerard Paisley introduced today’s judge Nigel Slater, giving brief details on his journey in obedience and then Gerard introduced the ring party for today and what role they would be taking on, they all received a good round of applause. The judge was wearing a dark grey suit, white shirt and multi coloured tie, the female stewards were in black trousers, grey velour tops with scarves under, each scarf a different colour, matching the regional colours for today. The male stewards were in black trousers, white shirts, multi coloured ties and a grey jumper. The competition then got underway with the Beginner’s class, first in the ring and representing Wales was Emma Baker and her X/B ‘Barney’ Lovely handling from Emma getting the best out of the dog, there was some wide work on the straights but the dog tried really hard to maintain his position. The gate exercise showed superb control, an attentive wait from the dog until he was called through and a quick sit at the handler’s side. Following them into the ring was Elspeth Brown with her BC ‘Tia’ for the Northern region, after a good heelwork round onto the retrieve exercise, the dog going straight out, a very neat pick up then as she turned to go back to the handler the dog had a quick look at some markings on the floor, remembered what she was doing and returned to a good present and finish. Then the recall the dog waiting with full attention on the handler coming up instantly on the call command, a fast run across the ring into a slightly off centre present and a wide finish. Representing the S. East & E. Anglia region were Patricia Charlton and her M. Schnauzer ‘Spike’, in the heelwork the dog showed total commitment to his work accuracy on the turns and holding his position well on the straights hardly giving anything away. In the recall the dog ran straight to the handler and into a very neat front present and tight finish, a super round to watch. Coming in for the South & S. West region was Jacky Shore and her NSDTR ‘Zanta’, the dog didn’t seem too sure of the surroundings at the start of the heelwork and stopped briefly to sniff at a corner marker but as the round progressed the dog gained in confidence and managed to hold a much better position especially on the turns. The set exercises were controlled and accurate, clear at the gate and losing just ½ mark on the recall and retrieve. Once the ringwork had finished the stewards set out the position cards for the down stay, all the dogs remained in the down until the handlers turned to go back to them, and the dog from the Scottish region ‘Alfie’ just had to stand up to greet his handler. The next class to work was Novice and each region is allowed to run two teams in this class. Starting the class off was Kelly Voaden with her X/B ‘Lemmy’, a good start in the heelwork with the dog trying hard to maintain a close position, the handler slowed slightly going into some of the turns and that made the dog drop back a little from his position. Little bits and pieces of wide work added up during the round. Last exercise was the Recall over hurdle and the dog waited patiently then came up instantly on command, a neat jump and into a slight knock on in the front present but a tight finish. Representing Scotland was Penny Crowe with her Staffordshire B.T ‘Ruby’, some wide work during the heelwork exercise but you could see the dog trying hard to hold her attention throughout the round, a lovely partnership to watch both obviously enjoying themselves. In the retrieve the dog went out to the dumbbell at a good pace, neatly picked it up and returned to a straight present, just a bit of mouthing as she did so. In for the S. East & E. Anglia was Eleanor Hogan and her C.K.C.S. ‘Sophie’, lovely handling bought out the best in this little dog who strived to maintain her position in the heelwork, most turns were neatly finished off with just a couple where the dog was looser but super heelwork from this pair followed by a brilliant recall over hurdle where the dog had no problems making a clear jump and straight into a neat present and finish, very good teamwork from this pair. Debbie Martin and her X/B ‘Fred’ came in for N. Ireland the dog tried hard to keep a consistent position in the heelwork exercise, just occasionally dropping back a little but the turns were well worked and they worked as a team complementing each other. The retrieve saw the dog go out at a good pace then a very careful pick up on the dumbbell and back to a straight present, lovely work. Straight onto the second set of teams in this class and in for the Northern Region was Rosie Colwood and her G. Schnauzer ‘Kitty’ their heelwork exercise was superb the dog held beautiful attention with just an odd wide on the straights and didn’t come out straight from a couple of turns. This pair work at a well measured controlled stride matching each other perfectly. Representing the S. East & E. Anglia were Amanda Winbourne and her GSD ‘Hattie’ after a well worked heelwork exercise onto the retrieve and the dog had full attention on the job in hand waited patiently until given the command then straight out to the dumbbell a good pick up and back to the handler, just off centre in the present and a wide finish. The recall over hurdle and again an attentive wait then cleared the jump with ease and applied the brakes at the right point to ensure a good present and finish. In for the South & S. West region was Shirley McIver and her A. Malamute ‘Luna’, the dog so obviously enjoying the heelwork exercise and trying hard to hold her position and attention, most of the round was well worked but not quite finishing off the left turns and just an occasional loose position on the straights but a lovely team to watch. The retrieve saw the dog go out at a good pace carefully pick up the dumbbell straight back into a good present and a quick bark going round to the finish. Once the ringwork was over there was a short break, just enough time to stretch your legs, whilst the ring was set out for the down stay exercise, all teams completed this with no breaks. A short break until 11am then back to our seats ready for the start of the next class – A – again each region is allowed to run two dogs in this class. First in and representing the Welsh region Anna Pleban with her Rhod. Ridgeback ‘Tahu’, a powerful looking dog and as they started off in the heelwork exercise handler and dog were matching each other stride for stride, covering the ground with ease, the dog held superb attention throughout this exercise and seemed to be enjoying his work. The straight work was very nice to watch but some of the turns were at too quick a pace and he just lost position going through them. The positioned retrieve was a little costly as the dog went out to the dumbbell, pounced on it, a messy pick up, then straight to the handler and a neat front present but a crooked finish. Coming in for the Scottish region was Kirsty Bidgood and her GSD ‘Mischa’, starting off in the heelwork exercise with just a little hesitation on some of the turns but then settled into a good pace and maintained a lovely position with attention solely on the handler, very straight on the longer lengths of heelwork and finishing the last few turns off squarely. The A recall saw an attentive wait followed by a fast run when called, the pick-up was almost on a left turn and the dog braked at just the right moment and went straight into a good heel position. Representing the South & S. West region was Angie Bailey with her G. Ret ‘Teague’ the dog went quite wide on the first about turn and as the heelwork progressed she bounced up quite a bit at the handler’s side losing position as she did so, another dog who seemed extremely happy in her work. The positioned retrieve saw the dog go out at speed then a scoop pick up on the dumbbell and a run on before turning back towards the handler, there was some mouthing at the front present. Last exercise was the A recall and the dog waited patiently then came up at a very fast stride, then steadied for the pick up into the heel position. Then the second set of teams in this class and representing the Northern region was Claire Charlton with her GSD ‘Zurhi’, after a good heelwork exercise onto the placed retrieve and the dog watched intently as the handler walked out and placed the dumbbell, on command he walked out slowly, picked it up very carefully then straight to the handler and a good present and finish. In the A recall the dog again never took his eyes off the handler but when she gave the call up he covered the distance quite slowly and was just off the pace on the short stretch of heelwork but finished with a very square sit. Representing the S. East & E. Anglia region was Barbara Short and her BC ‘Misty’ the dog trying hard to maintain position and attention in the heelwork, just some wide work on turns and not coming out of them squarely. Onto the placed retrieve and a very neat pick up on the dumbbell, returned immediately to the handler but just off centre in the present, a very confident exercise for this pair. The dog showed super concentration in the A recall when as the handler gave the call up, the tannoy came on overhead, but the dog did not hesitate, knew she had been called and went straight to the handler’s side and picked up into the heel position with ease. Samantha Rice and her NSDTR ‘Voros ‘came in for the South and S. West region and they gave us a display of lovely heelwork the dog holding superb attention throughout. The dog misread an about turn and almost turned left but quickly corrected the mistake and settled back into his stride. Just a little untidy on some of the left turns after that but he was obviously loving his work, a very happy dog and a nice team to watch as Sam’s upright handling suits him well. They finished off their round with the A recall and the dog had a cheeky look around as Sam walked off but switched his attention straight back to her, quickly up on command and braked just right to go into a tight heel position. As soon as the ringwork had finished we managed a quick stretch of the legs whilst the ring was prepared for the scent exercise, a row of six cloths to be laid out with the handler’s cloth at number five. First into the ring for the scent was Anna Pleban with ‘Tahu’ for the Welsh region, the dog working straight up the line of cloths, a positive find on the right one, straight back to the handler but was chomping on the cloth on the way, he forgot to stop quick enough and there was a knock on in the front present. In for the Northern region was Jayne Jenks with her X/B ‘Para’ who also worked straight up the cloths, picked up the correct one very carefully and returned but went into the present at an angle and then a crooked finish. Debbie Lammin and her Puli ‘Dancer’ came in for the S. East & E. Anglia region the dog went out over the cloths, carried on working with his nose towards the top end of the ring, he tracked back to the top of the line, picked up the right cloth and returned to the handler. Last team to go in this section and representing N. Ireland was Janette Mitchell and her S.S. ‘Finlo’ the dog working up over the cloths checking each one methodically, a positive fine and straight back, just slightly off centre in the present. Then straight onto the second set of teams and in for the Northern region was Claire Charlton and her GSD ‘Zurhi’, another dog who did a methodical search over the cloths, found the right one then returned to a crooked present and finish. Coming in for the S. East & E. Anglia was Barbara Short and her BC ‘Misty’, the dog going up the line of cloths, neatly checking each one before picking up the right one, turned and straight back but into a very crooked front present and the dog was wide going to the finish. In for the Midlands region was Lyn Griffin with her GSD ‘Ace’ another dog that did a good steady search over all the cloths, found the right one with ease but then chomped on it as he returned to the handler and into an off centre present. Last team in for this exercise was Helen Boyde with her WS ‘Lyric’ representing N. Ireland. A quick search of the cloths, working up and down the line then a positive find and straight back to the handler. Again a short break whilst the ring was cleared and the position cards for the next exercise – the sit stay were put out. Unfortunately, five dogs broke, but this did not really affect the final placings. The Individual winner of class ‘A’ was Anna Pleban with ‘Tahu’ for the Welsh region. A break for lunch from 1pm until 2.15pm, time to have a look at some of the stands in the other halls, a bite to eat and the inevitable queue at the ladies. Looking around there have been quite a few people coming into the free seats during the morning session but many of the charged for seats remained empty, which is such a shame. Back into our seats at 2.15 for the next class – ‘B’ the send away markers for this class are two large colourful balls mounted on a base for the front markers and the back marker is a large black board with planets on. Representing the Northern region was Gillian Strickleton with her BC ‘Mikey’, starting with the send away and the dog went out at speed with an almost instant drop into the down at the back marker followed by a fast pick up into an accurate heel position. The heelwork exercise saw the dog holding superb attention and a very close position at heel, a nice stride in the fast pace but some of the turns were a little loose. The slow pace was worked with total concentration with well executed turns and neat footwork from both handler and dog. In normal pace the dog almost sat on some of the turns not seeming to get properly into the stride for that pace, but overall a well worked round. In for the S. East & E. Anglia region was Wendy Wheatcroft and her G. Ret ‘Jethro’, The heelwork started in fast pace and the dog gave super attention and held a consistent position throughout the pace, slow pace was well measured and they complemented each other well. In the normal pace the dog pushed on a little and was forward for some of the left turns. The retrieve over hurdle saw the dog jump with ease both ways, a neat pick up on the article, which was a shower scrunchy, and then back into a neat present, just going a little wide to the finish. John Clark and his WS ‘Obie’ came in representing the South & S. West region, after a good send away onto the heelwork exercise and it showed how much of a partnership this team is, the fast pace was done with a lovely stride from both handler and dog, some of the turns were w little loose but on the whole they were well executed, slow pace was well controlled and at a well measured stride just an occasional look forward from the dog which took him out of position, they gave little away, lovely teamwork. Last to work in this round was Gwyneth Bell and her X/B ‘Archie’ for the N. Ireland region. In the send away the dog went out at speed but slowed quite a bit heading towards the left hand marker and the handler gave the down command, he waited with full attention on the handler and at the call up had quite a turn of speed going across the ring but didn’t manage to apply the brakes at the right spot and he was wide in the pick up to heel position. The last exercise, the retrieve and the dog jumped out with ease but a very messy pick up before returning to the handler. The ringwork was over by 3pm and a short break whilst the ring was prepared for the scent exercise – a total of 10 cloths with the handler’s cloth, 8 blank cloths and a decoy cloth in a pattern decided by the judge. Coming in for Wales was Alison O’Connor with her WS ‘Flake’ The dog seemed to find the cloth straight away but decided to check a few more before picking the right one up and returning to the handler, a good present but then didn’t go fully round to the finish. Representing the Northern region was Gillian Strickleton and ‘Mikey’ the dog went out, worked over the scent pattern, found the right one and straight back but a slightly crooked present and finish. In for the S. East & E. Anglia region was Wendy Wheatcroft and her G. Ret ‘Jethro’, the dog going out at a good pace checked on a few cloths, a careful pick up of the right one and straight back to the handler, just slightly off centre in the present. In for the South & S. West region was John Clark and his WS ‘Obie’. The dog working his way over the cloths, found the right one and returned to a straight present and neat finish. This was the only clear scent of the whole competition a textbook exercise. Last to work was Gwyneth Bell and her X/B ‘Archie’ for the N. Ireland region the dog going straight to the scent pattern, quickly finding a cloth that he thought was the right one but unfortunately it was a decoy. Then the final exercise for this class – the down stay with handlers out of sight. All the dogs completed the stay and the audience applauded loudly as the exercise finished. The Individual winner of the ‘B’ class was Gillian Strickleton with her BC ‘Mikey’ representing the Northern team. Whilst the ring was prepared for the next class – ‘C’, we just had enough time to join the queue for a coffee before returning to our seats. The Send away for this class has the same back marker as for the ‘B’ class but the front markers are large tennis balls. Coming in for Wales was Emma Hughes with her G. Ret ‘Alfie’. Starting with the directed retrieve- in which the handler draws a number either 1,2, or 3, out of a bag then lines the dog up towards the numbered dumbbell – ‘Alfie’ went straight out to the dumbbell at the left hand side a slow pick up then back to the handler and just off centre in the present then he forgot to sit at the finish. The heelwork started at fast pace and this team flowed, the dogs position and attention were super. Dropping down into slow pace the dog started well but then lost position a little and didn’t come cleanly out of some of the turns, regained some confidence as the round progressed and tried hard to maintain his position, the attention he gave was lovely and he looked as though he was thoroughly enjoying his time in this ring. Representing the Northern region, we had Jeny Miller with her X/B ‘Chello’ The directed retrieve was superb, straight out to the right dumbbell, no hesitation on the pick-up and back to a straight present and close finish, marked clear, the only one in this class. Onto the heelwork and that was carried out with confidence, the dog responding well to Jeny’s calm confident handling, the difference between the three paces was excellent and the DC/ASSD positions were carried out with apparent ease. The turns in all the paces were finished off squarely and the dog held superb attention throughout. a beautiful display to watch. Representing the Midlands region was Kaye Ball and her G. Ret ‘Belia’, directed retrieve and the dog went straight to dumbbell no.3. a neat pick up but then deviated slightly as she looked across at the other dumbbells, a slightly off centre present and a wide finish. After a solid heelwork round onto the send away and the dog went out towards the markers but stopped about ¾ of the way across the ring looked at the handler who gave another command to send her on, but she started to slow again at the front markers and the handler gave the down command which she did instantly, a fast pick up with the brakes applied just at the right moment to go into a very good heel position. The last team to work and coming in for N. Ireland was Kate McCartney with her BC ‘Truly’ In the heelwork they set off in a lovely long stride in fast pace the dogs full attention on the handler. The transitions between paces were carried out instantly with a good definition in the normal and fast paces. Going into the slow pace and the dog seemed to push forward a little and rushed the turns. Onto the send away and a fast run across the ring followed by an instant down in front of the back marker, waited attentively then straight to the owner on call up and just needed to brake a tad earlier going into the heel position. By 4.30 the ringwork was finished and the ring was prepared for the scent exercise for this class. Coming in for Wales was Emma Hughes and ‘Alfie’, the dog going out smartly over the pattern of cloths found the right one quickly and returned to the handler, just slightly crooked in the present and he didn’t sit at the finish. Next in representing the Northern team was Jeny Miller with ‘Chello’, the dog gave an excellent search of the cloths, found the right one quite quickly and returned back into a straight present and finish. In for the Scottish team was Sara Jane Campbell and ‘Arca’ the dog going out at a good pace, a careful check over the cloths, picked the right one up and returned to the handler, a lovely exercise. Representing the S. East & E. Anglia region was Wendy Birch with her WS ‘Della’ the dog went out to the scent area checked a couple of cloths, found the right one and returned into a straight front present. Coming in for the South & S. West was Kay Allen and her BC ‘Tor’ a long search by this dog, working methodically over the cloths, picked up the correct one, deviated slightly towards the steward on return then stood in the front present. Once the exercise had finished the ring party prepared for the 2 minute out of sight sit stay, in which all the teams were marked clear. Once the final placings were worked out the ring was prepared for the final parade. The Judge and his team came in and took up their position on the left hand side of the ring, then the music struck up and the teams came back in to a great welcome from the audience. There was a thank you and presentation to the judge and his ring party for their brilliant work here today. Then the results were announced for the Individual Class Winners and all the other individual places which went down to fourth place. As each handler and dog came out to their place board they received a round of applause and cheers. Then the announcement of this year’s Team winners and that was the Northern Region and as they all came forward to the first place board there was a massive ovation from the audience, a very delighted team. Called into second place was the team from the South & S. West and they also received a superb greeting from the audience. 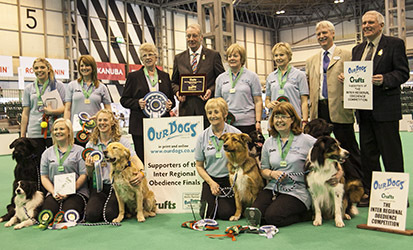 A superb competition in here today and it really does show that virtually any breed of dog can have their place in today’s Obedience community.